Our 99 Second Talks are becoming more renowned with each TestBash (our software testing conference), we even have a section on The Dojo dedicated to 99 Second Talks. At TestBash Brighton we had some outstanding talks - one, in particular, rang all the bells. There was lots of nodding and agreement around the room as Ali Hill delivered this rousing talk titled Choose Not To Be A Software Testing Hero. 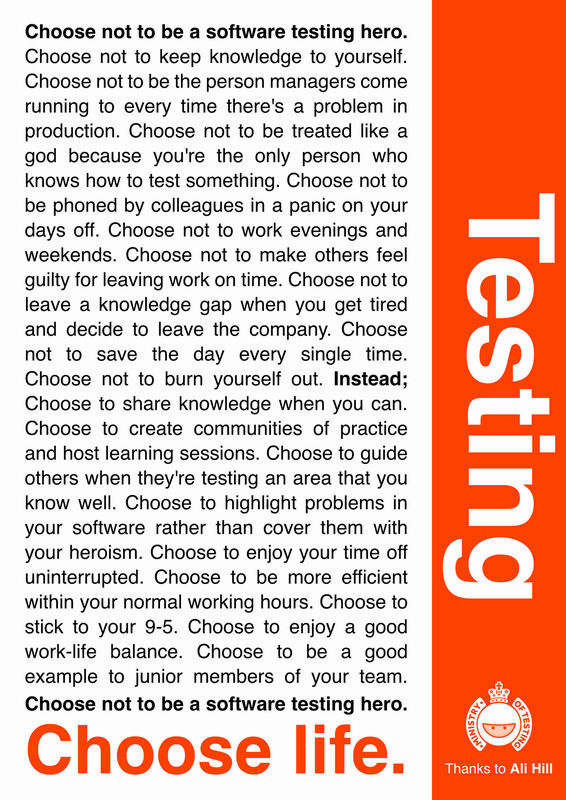 We all remember the monologue from Trainspotting, now you can download your own version of Choose Not To Be A Software Testing Hero, print it out and stick it next to your computer.